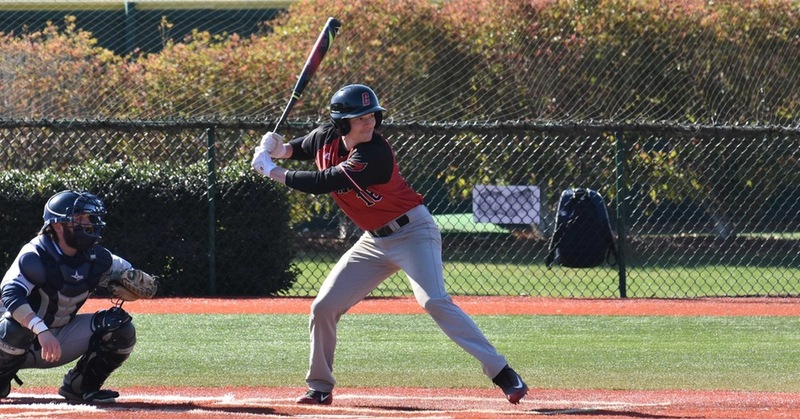 After an explosive start to the season, the Catholic University baseball team is resting on a 17-5 overall record after Wednesday’s 18-9 win against nearby Gallaudet University. The Cards had a strong first inning at the plate. Junior Ryan Tracy hit a double that brought senior Jack Hennessy home from second, and junior Bailey Lewis earned an RBI with his double bringing Tracy back to the plate. Singles from Connor Sullivan and Christian Jones earned both the sophomores RBIs to end the bottom of the first for Catholic with four runs on five hits. An RBI sacrifice fly from Hennessey and a right field double from senior Brennan Cotter earned the Cards three more runs in the second inning and advanced their lead to 7-0. Gallaudet earned one run in the third, and scored four in the fifth on two singles and a double. After showing up in the fourth inning with three runs, the Cards added on to their five-run lead with an explosive six-run inning in the bottom of the fifth to advance the score to 16-5. Freshman Michael Doody singled to bring home classmate Tighe Watson, and freshman Billy Duke hit a double to right field to bring home freshman Cole Campbell and senior Anthony Ferlise. Freshman Keith Campbell then hit a two-RBI single to bring home Doody and Duke, and freshman Kendrick Russer earned the last run of the inning with a unearned run that brought home Campbell. After striking out seven batters in the first four innings, senior pitcher David Gately was replaced by freshman MJ Dzickowski in the fifth, who finished out the game. The Bison rallied to earn two more runs in the sixth, and both teams earned two runs in the seventh, to end the game 18-9 for the Cards. With 17 runs coming from their forty at-bats, the Cardinals were impressive at the plate Wednesday afternoon. The underclassmen got a turn at the bat and earned the team eleven RBIs towards its 18 runs, with Duke leading the game with 3 RBIs and fellow first-years Campbell and Doody earning two each. The team received its first-ever national ranking on D3baseball.com / National College Baseball Writers Association (NCBWA) Top-25 Poll, peaking at #14 before dropping down to number 24 after losses to Drew, Salisbury, and Susquehanna. The Cardinals have a chance to climb back up the ranks as they’ll take on the Elizabethtown Blue Jays this weekend in a homefield Landmark Conference weekend series. The team currently sits in third in the Landmark Conference with a 5-4 record. The first two games come in a double header on Friday, April 6th at 12:30 PM and 3 PM, and Sunday, April 7th at 12 PM, before traveling to Johns Hopkins on Monday.